AMC revealed the trailer after their ‘Walking Dead‘ panel when exec producers took the stage to discuss the spinoff. 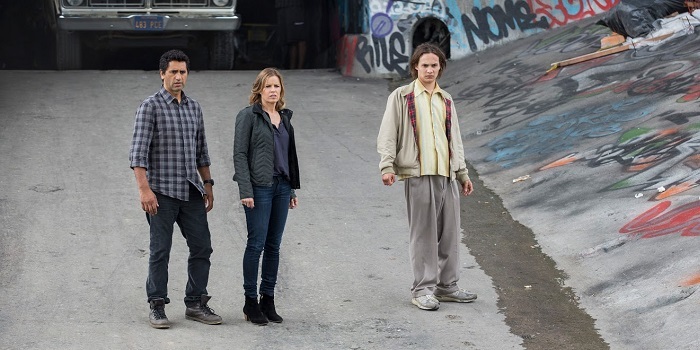 They were also joined by cast members Cliff Curtis, Kim Dickens, Frank Dillane, Alycia Debnam-Carey, Elizabeth Rodriquez, Lorenzo James Henrie, Ruben Blades and Mercedes Mason. Gale Ann Hurd, Robert Kirkman, Dave Alpert and Greg Nicotero are the EP’s for the show and all but Kirkman were present to talk about the Los Angeles-set spinoff that promises to show us the early days of what becomes the zombie apocalypse and even though it’s based in LA, showrunner Dave Erikson told those gathered “By the end of the season, we get to see what happened to Atlanta.” Fans were also promised a debut of August 23 with a 90-minute episode. What do you think about the show, do we have too many, have zombies permeated TV and film too much, who’s going to be watching? Sound off in the comments. This entry was posted on Friday, July 10th, 2015 at 6:15 pm	and is filed under Comics, Events, News, Television. You can follow any responses to this entry through the RSS 2.0 feed. You can skip to the end and leave a response. Pinging is currently not allowed.